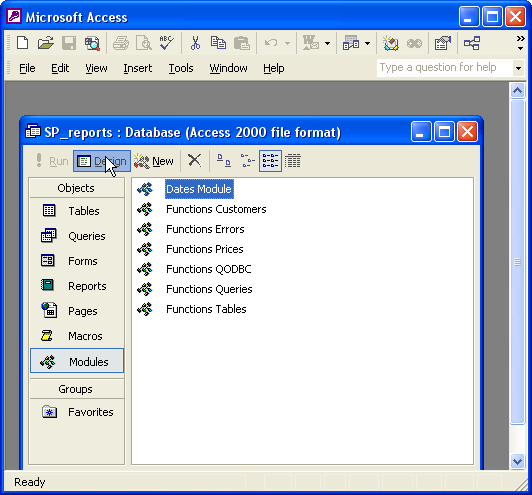 You cannot exclude Classes from a Profit and Loss Report in QuickBooks® but you can using QODBC and Microsoft® Access. 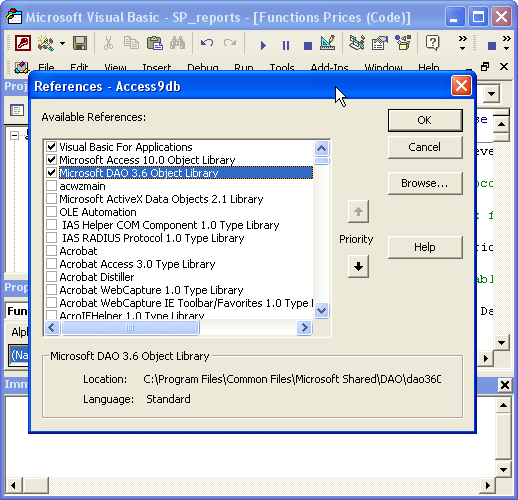 With a bit of code, you can create the report with the click of a button. 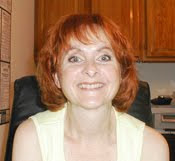 The idea for this tutorial sprung from a request on Experts-Exchange where I participate and offer solutions pro bono for various issues, usually involving QuickBooks® and QODBC. I never needed to exclude classes from a Profit & Loss Report but evidently this is a common request. The issue intrigued me enough to write the code from scratch, create the form and offer it as a solution. The recipient was very happy with the results and it solved their problem. This is a Two-Part Post. Be sure to click continue to go on and finish the database form and create the report. 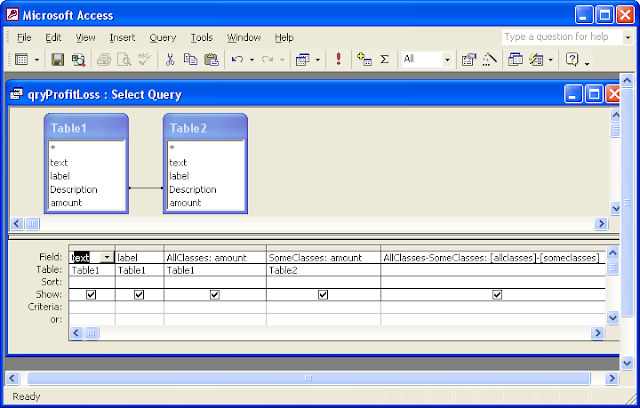 Creates a Select query, joining the two tables by the Description field and creates an additional field that subtracts the Table2 amounts from the Table1 amounts. Opens a Report for the user to design. Sets the new report's record source to qryProfitLoss. Fix up the form any way you like. You may use input masks for the date text boxes (wise), adjust the size of the listbox, etc. 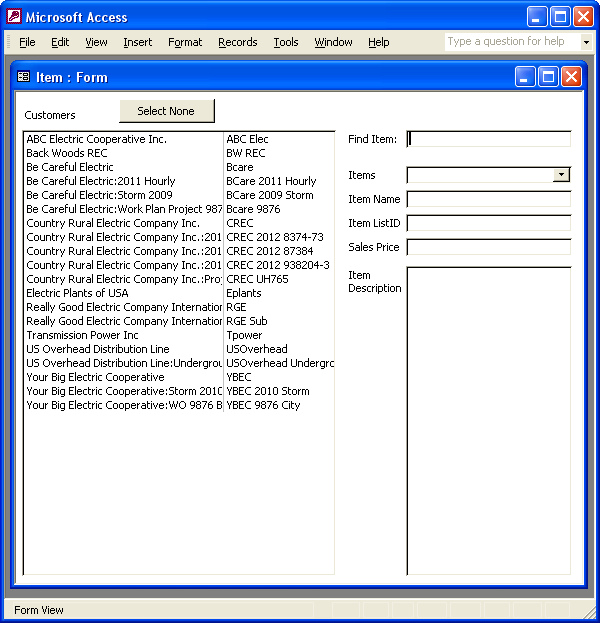 Do not worry about the listbox columns or source, the code will do that. Double click the form you created from the Project Explorer. 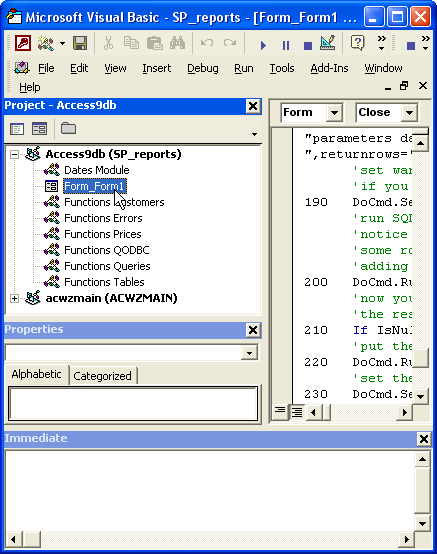 If you do not see the Project Explorer, select it from the View menu of the Visual Basic Editor menu bar. Besides the code below, you will need 3 additional functions. 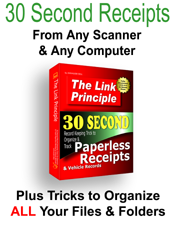 These additional functions reside here on VBQuick and my other site The Generic Database. At the end of this code, the links will appear to the 3 functions you need and you may get them and put them in a new module. You need them to run this code. 120 MsgBox "enter a From Date"
160 MsgBox "enter a To Date"
190 MsgBox "Select at least one Class to exclude." 260 qd.SQL = "SELECT Table1.text, Table1.label, Table1.amount AS AllClasses,Table2.amount AS SomeClasses, [allclasses]-[someclasses] AS [AllClasses-SomeClasses] FROM Table1 INNER JOIN Table2 ON Table1.Description = Table2.Description;"
190 qd.SQL = "select listid,fullname from class"
230 lstClass.RowSource = "Select * from tblclass order by fullname asc"
130 ClassSQL = ClassSQL & "'" & lstClass.ItemData(varItm) & "',"
180 qd.SQL = "sp_report ProfitAndLossStandard show text,label,amount_1 as amount parameters datefrom=" & fncQBDate(DateFrom) & ",dateto=" & fncQBDate(DateTo) & " ,returnrows='All'"
' Search for the report ProfitLoss in the AllReports collection. 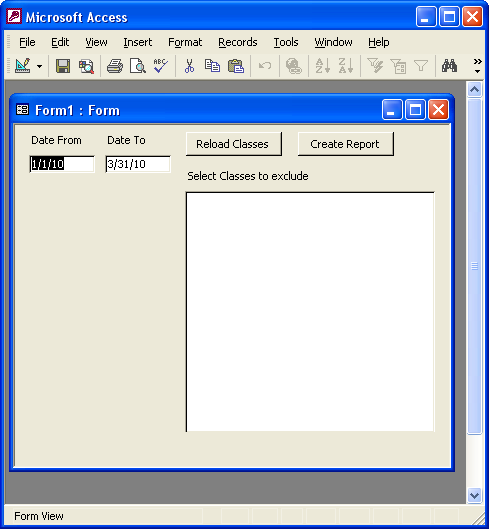 260 MsgBox "Please design your report and save it."